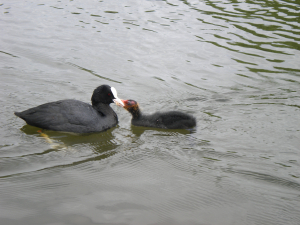 Observation - Coot feeding a chick - UK and Ireland. Description: The lake in Abington Park in spring time is full of birds feeding their young. The lake in Abington Park in spring time is full of birds feeding their young.